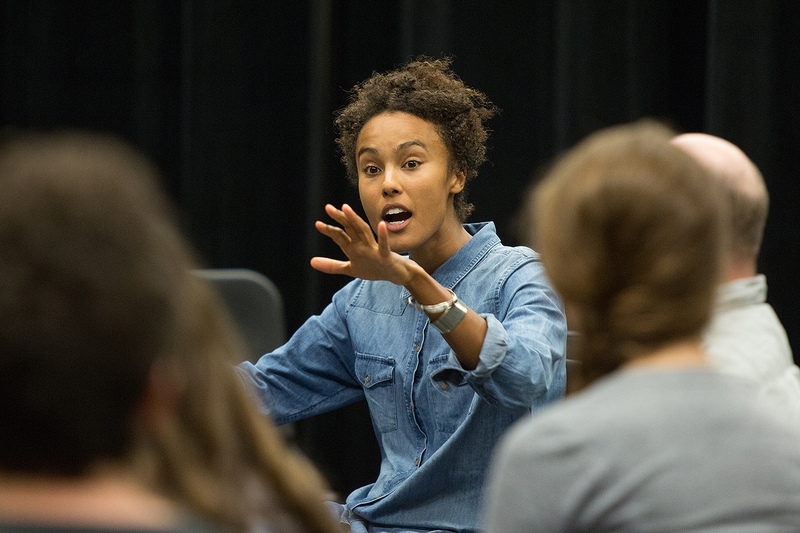 Actor and director Kaneza Schaal ’06 returned to campus for her New England premiere of GO FORTH (2015), a series of vignettes with projection, sound, and dance inspired by the Egyptian Book of the Dead. The four performances took place over the past weekend to a sold-out audience. Schaal credits her time studying theater and psychology for preparing her for a creative career. “What I gained at Wesleyan was the opportunity to learn many languages, psychology, and theater, which all came together to how I make my work.” Furthermore, she explained that it was the faculty and staff who really supported her to go out and make what interested her. After Wesleyan, Schaal came up in the downtown experimental theater community, first working with The Wooster Group, then with companies and artists including Elevator Repair Service, Richard Maxwell/New York City Players, Claude Wampler, Jay Scheib, New York City Opera and National Public Radio. Schaal is an Arts-in-Education advocate and just returned from a new project with the International Children’s Book Library in Munich, Germany working with young Syrian and Eritrean refugees to address migration and storytelling.